We're worm gearbox repair experts. Unlike smaller machine shops, we're gearbox specialists with expertise in reconditioning, repairing and rebuilding a wide array of gearbox types, including right angle worm gearboxes. We work on all types of gears, including worm gears. BROKEN WORM GEARBOX? WE CAN HELP! We offer rapid personalized response to your call and speedy repair of your worm gearbox, so your downtime is kept to a minimum. 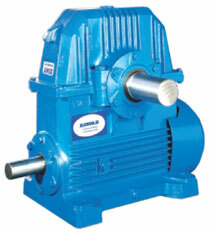 In fact, no one can help you get a broken worm gearbox back up and running faster than QRS. Every aspect our operation is designed to achieve that end – from our fully-equipped, 150,000 square foot facility and highly skilled technicians backed by computer-assisted engineering to our comprehensive testing procedures that enable us to pinpoint problems quickly and efficiently.